So, here’s the jist. Every city worth its weight in salt has some form of public transportation that ties everything together. 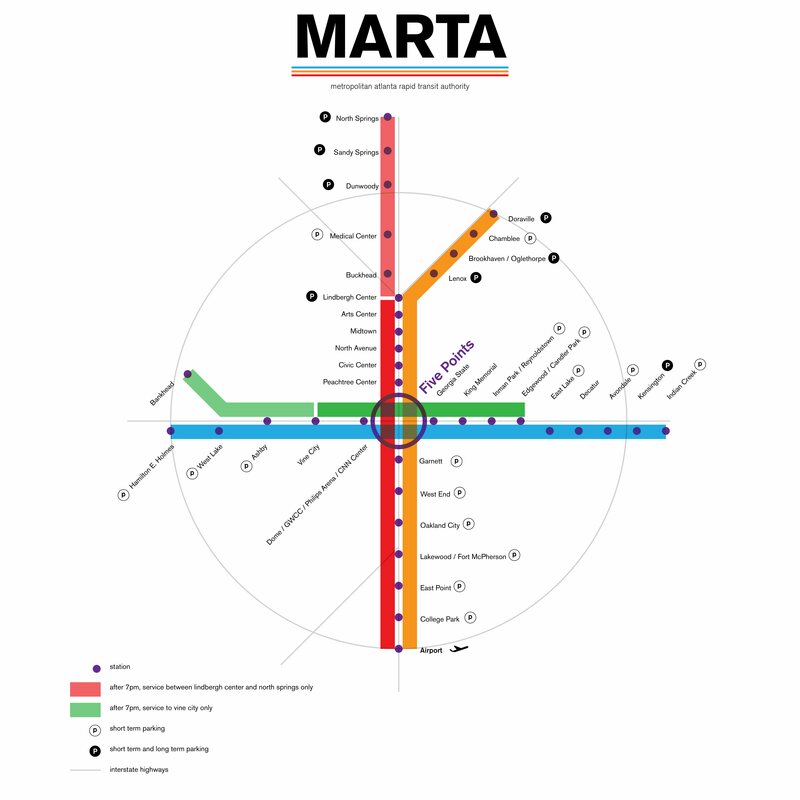 In Atlanta, it’s called MARTA: The Metropolitan Atlanta Rapid Transit Authority. The system consists of two main branches: a bus network that serves the metropolitan area within Fulton, DeKalb, and Clayton counties; and a rail network that primarily functions within the I-285 Perimeter. For many an Atlantan, MARTA’s rail service lies at the heart of what MARTA is all about. We’ve included a map here, but in short, the main rail line consists of a north/south line (represented in red and gold), and an east/west line (represented in green and blue). The one main hub, that offers both north/south and east/west service is Five Points Station, located in the middle of Downtown. There are several hubs that radiate outward from this center point, covering the city, mainly within the I-285 Perimeter, in a “cross” shape. The majority of the commercial and economic centers of Atlanta are located within walking distance of a MARTA rail station: this includes the centers of Downtown, Midtown, Buckhead, Decatur, and various neighborhoods throughout East Atlanta (mainly along the DeKalb Avenue corridor). The trains can travel upwards of 70 miles-per-hour, which is pretty quick. For example, getting from one end of the north/south line to the other end takes only about 40 minutes. The airport (ATL) lies at the southern end of the red/gold line. For a city that relies so heavily on its airport, this is a major bonus, as travelers can avoid delays on the road altogether. You hardly ever wait for any more than 10 minutes for a train to show up. Usually, it’s a lot less than that. The fare is reasonable. While there are a number of discounts available, a typical one-way trip costs about $2.50. Most Atlantans have a “Breeze Card” in their pockets that they top up in advance. Hey, it’s a big city. If you look at the map of the rail lines, you’ll notice that a lot of neighborhoods aren’t within an easy walking distance to a MARTA station (walkability to MARTA rail stops has long been a selling point as far as Atlanta homes are concerned). There is, however, a bit of a fix for this… Parking. Let say you live in North Decatur, and you work in Midtown. Home is a couple of miles away from a MARTA stop, but your office is, for example, a block away from Arts Center Station. A lot of Atlantans have this problem. So, they split their commute to be as unstressful as possible. They may drive to East Lake Station, where there’s daily parking, hop on a train, and get to work in less time than it takes their contemporaries who choose to drive the whole way. Plus, they get to catch up on emails on their way to the office. At the end of the day, they just reverse course. Point is, there are many MARTA rail stations that offer daily parking. What’s more, there are stations that offer long-term parking, too. Remember how we mentioned that the airport is a big deal? A lot of the stations on the north/south line offer long-term parking for just $5-$8 a day. If you’re flying out of Atlanta for a week or two, this will be a whole lot cheaper than paying the daily parking rates at the airport, and all you need to do when you return is hop on the train, and rendezvous with your car. Our advice? Determine how important your commute is to you. Figure out where your office is, and where your home is, and act accordingly. MARTA is invaluable and it’s pretty reliable, and no matter your situation in Atlanta, you’ll be taking it from time to time. Learn to love it. MARTA runs 365 days a year. Hours from Monday – Friday are 4:45 a.m. to 1:00 a.m. Hours on weekends are 6:00 a.m. to 1:00 a.m. Hours are extended for holidays like New Year’s Eve, Independence Day, etc. You’ve probably heard of the BeltLine, right? That awesome, city-wide walking trail that will eventually encircle the entirety of inner Atlanta? MARTA is looking at this element of Atlanta’s future to figure out if a light rail option would be feasible. Fingers crossed — that would be a big deal.